Moving can be a daunting task for many people. 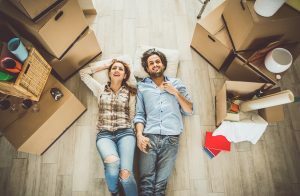 There is a lot of packing involved and unpacking once you get to your new home; however, with proper planning, you may even find yourself enjoying the moving process...unless you get stuck. This guide serves to offer you simple ways to move into your new home. It is advisable to plan at least eight weeks before you're going to relocate. A last-minute rush can bring a lot of confusion and stress. To plan this far ahead, though, you need a list of tasks to do. Select the items that you will be taking with you and leave items that you haven't used in the last year. Be selective and make sure you're not packing unnecessary items. You can donate the rest of your belongings to the needy or give out to friends. Do not pack your clothes, shoes, and bags in one big box. It can be quick to do so, but it will be a nightmare when it comes to unpacking. Organize the items in different clean boxes and label them with a marker. This way, you will have an easy time unpacking, and the movers will know which room to place the boxes. You should have an emergency box where you can keep all the essential items, such as clothing and kids supplies, that you'll need for the first 24 hours after you move. Moving can be tiresome, especially if you are working and have a family. It's okay to take a break and have a drink if you're feeling too stressed out. It can be challenging to ask for help; however, many people know the experience of moving and how hard it can be. Talk to family and friends and agree on a day to come over and help you pack. It could be an opportunity to spend time with them, especially if you are moving far away. Afterwards, you can all go out for a meal. If no one is available, you can call packers to help you with moving heavy boxes. The last thing you want to do is end up relocating before the moving date. When you buy a property, get in touch with your real estate agent to make sure of the exact time you're supposed to move. Also, when renting a property, don't just assume the date given in the lease is when you are supposed to get into your new home. Make a call to the landlord or agent and double-check the day. It can save you a lot of time and hassle. Packing takes a large amount of time and energy. You should be careful to avoid breakages that will result in extra costs. If there are expensive items, ask for assistance; there is a lot of information about moving insurance for valuable items. After being sure that you have packed all the necessary things, it is time to call a moving company. Moving companies in Austin, Los Angeles, Miami, or any other major city offer high-quality services to their clients. Make sure that the company is licensed and insured for the safe delivery of your items to your new location. In case of any breakages, you are sure to have the piece replaced. When you follow the above tips, moving will be an enjoyable task. Eat well to boost your energy levels. Carry enough snacks on a moving day, especially if you are going far. Also, make sure you have enough water to stay hydrated. When you get to your new home, do not unpack everything at once. You should first rest and start unpacking carefully to avoid damage. What a wonderful post it is! Due to some family issues, we need to move to a new city in next month. With your tips, I am hoping to experience a hassle-free and tension-free shifting. Thanks for the post. What a great article. Moving is not all that stressful when you’re organized. Packing items in order, and separating everything can save you HOURS in the moving process. Good stuff! Great tips back up here. with perfect planning you can make it less stressful and opting for the right day is most important. thank you for these tips! very helpful. These tips are great and helpful. Planning ahead and organization is the key. Great article!